Recorded towards the end of 2008 using only a vintage analogue synthesizer and a mixing board, Dying Star is an eight-part, fifty-minute work from drone purists Celer, whose inscrutable discography continues to expand after the incredibly sad and untimely passing of one half of the duo; Danielle Baquet-Long. The accompanying notes state that the motivation behind these pieces was to create something rooted in improvisation that captured a sense of being “completely pure and secluded”, that “stands as a fading presentation of memory, time, and loss, set against the ending day”. Typical of this act’s elusive, understated output, Dying Star is mastered at a very low volume – something that encourages cranked up headphone listening. Once your playback levels are adjusted accordingly, the continuous ebb and flow of warm tones proves powerfully immersive and crystalises itself at key moments of self-contained loveliness – in particular the eleven-minute ‘How I Imagine My Hand Holds Yours’ which seems to be the most dynamic and well-rounded track of the bunch. Never ones to employ excessively showy or contrived techniques, Celer continue to very quietly excel in their field by hinting at the elegant simplicity of early electronic drone music. Lovely. Late one evening, about two weeks ago, i & the Beloved found ourselves high on a hillside in Cornwall. The wild moorland in this far southwest corner of England is characterised by precisely two things: vast granite slabs that put the ‘rude’ into protrude, & even bigger stone mines & chimneys, their ruins peppering the landscape with almost amusing prevalence. Caught between the twin immensities of nature & industry, it’s a beautiful, evocative place, & as we explored one particular ruin, the day literally began to die around us. Across on the west side of the valley, the sun began to set, becoming a fiery bronze circle in the sky. From the time it first touched the fringes of the hilled horizon to finally being absorbed within it can only have been a few minutes, but the magic of the moment made it impossibly longer, stretching each second in order that our senses might be able to savour their passing. 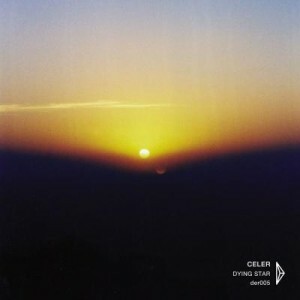 Upon my return home, Celer’s latest release, Dying Star, was waiting for me, the listening experience of which takes me straight back to that Cornish hillside. It’s not just the title, or even the overt sunset shown on the cover; this is emphatically evening music, perfectly capturing the sense of things passing, closing, readying themselves for sleep. Appropriately, Will & Dani’s drones are more reserved than usual, kept at a distance by their unwavering calm & dynamic softness (Will recommends listening with the volume at 80%; do it, it works perfectly). This aspect especially—the resolve to keep the material a hovering mezzo-piano throughout—is bold & impressive (i’m reminded of advice given to me many years ago: if you really want to get an audience’s attention, play increasingly quietly; loud music can be—& is—more doggedly ignored); there’s ever the sense that, at any moment, the music might just pass away completely, which makes the minutes we are given—&, generously, Celer give us nearly 50 of them—all the more tantalising & significant (track title “I could almost disperse” says it all). & that is what continues to be most remarkable thing about Celer’s œuvre: the astonishing way that such radically pared-down material is nonetheless so miraculously full of life & energy, so emotional & allusive. The more one listens to their drones, the less they sound like such, seemingly filled to bursting with ebb & flow, gentle eddies & currents worrying the material at some fathomless depth; from this perspective, moments of slight but noticeable change—such as the exquisite opening of the fourth track, “On the Edges of Each Season”, with its insistent growing cluster & deep, only half-perceptible rumbling bass—become almost shockingly novel. It feels like a while since we’ve had a new Celer CD in. Celer’s release schedule has slowed down of late which is probably a good thing really as over saturation of artists is a never a good thing. It can feel a bit daunting sometimes when an artist has recorded that many albums and you just don’t know where to start! Sabbaticals are always welcome! ‘Dying Star’ is also a step on from previous works so welcome to a new Celer sound! It’s more electronic tones and drones and fans of Eleh will appreciate this. It’s a bit busier than Eleh but it’s along those simplistic lines. It’s very introverted simple yet beautiful music which will appeal to all fans of the drone genre and one that gets my thumbs up. Excellent stuff!! Celer is the musical offspring of Will Long and Danielle Baquet-Long, a husband and wife whose posthumous discography now runs into the dozens. Typically their ethereal drones are composed from highly processed recordings of environmental sound or acoustic instruments such as piano, violin and flute. Their recent album on Dragon’s Eye, Dying Star, is both one of their most subdued sonically, and one of the sparsest in sonic origins, using only an analog synthesizer and a mixing board. Granted, analog synthesizers can produce a wide variety of sound, but the sound world here is remarkably consistent, a steady pitch with gently hovering overtones. Volume is generally low and events are few, a thinning or thickening of the harmonic texture and an occasional ringing emphasis in the overtones. The surface calm and relative homogeneity seems especially apt for an album entitled Dying Star. Although the album is divided into eight tracks, there is only subtle audible differences to distinguish them in the listener’s ear. Celer often uses track boundaries for purposes other than delineating musical divisions, and the track titles read like one of the poems that have graced other albums or Celer’s blog. Track boundaries are an unusual playground for sound artists. The Hafler Trio, in its long search to challenge perception, released CDs where the track layout didn’t correspond in the slightest to the sequence of individual pieces. But I don’t think this is Celer’s motivation, which almost seems more like an acknowledgment of the essential disordered quality of the spiritual and emotional states presented by their music. Yet despite the seeming placidity of the Dying Star‘s trajectory, the album’s most poignant moment comes at the beginning of the final track. Flickers (Goodnight) is the only track that doesn’t begin in silence, but instead is crossfaded directly from its predecessor. Even more significant, its continuing drone is overlaid with the only two even mildly percussive events, aptly characterized by the flickers in the track title, coming at the very beginning of the track and echoed about forty seconds in. These two events, so quiet as to be barely suggested, and appearing only after forty minutes of quiet undulating drones, are Dying Star‘s hidden treasure. Is it the dying star finally imploding, creating a brief flash all too easily overlooked? Has the listener drifted into an oblivious somnolence and heard it only in his or her dreams? Celer makes a call to the listener’s attention and imagination and thereby elevates this release to one of their best. Dying Star might be the purest Celer recording to date, though such a claim might seem questionable given the degree of purity that characterizes every release issued by Will Long and the late Danielle Baquet-Long under their project name. But consider: Dying Star was realized using nothing more than a vintage analog synthesizer and mixing board—no field recordings or instrument sound sources of the kind heard on other Celer recordings found their way into the recording process. Adding to the recording’s ascetic design, the eight-part work was completely improvised, and no overdubs or post-processing were involved either when it was recorded in the fall of 2008. In keeping with its elegiac title, the work exudes an hermetic and retiring character that can’t help but make it feel like gesture of mourning or requiem for the premature passing of Danielle and the eventual end to the Celer project itself—a memento mori, in other words (in Celer’s own words, the recording “stands as a fading presentation of memory, time, and loss, set against the ending day”); the track title used for the work’s longest part, the eleven-minute “I Imagine My Hand Holds Yours” would appear to confirm as much. As such, Dying Star unspools at a low volume level—the recommendation is included that one should listen to it via headphones with the volume set to eighty percent—with each graceful part appearing and slowly fading away, clearing a space for the next one to repeat the pattern. Throughout the recording’s fifty minutes, soft string- and whistling, organ-like tones rise and fall and advance and recede, often at levels that are so close to inaudible they create a level of tension that’s interestingly at odds with Dying Star‘s overall peaceful character. The gradual withering away that occurs as each part moves towards its close proves, in fact, to be one of the most exquisite things about the recording, and the degree of detail is so purifed that the tiny starburst that appears at the start of the closing part, “Flickers (Goodnight),” has a far greater impact than such a small accent would otherwise have.